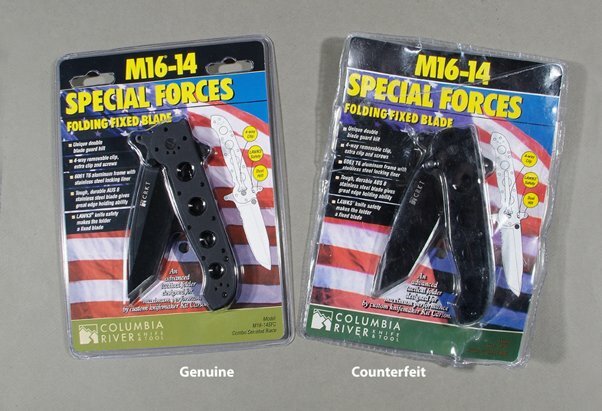 BEWARE OF COUNTERFEIT KNIVES BEARING THE COLUMBIA RIVER KNIFE & TOOL® (CRKT®) TRADEMARK. As a manufacturer of quality knives and tools, Columbia River Knife & Tool® (CRKT®) has worked hard over the past 15 years to build a brand recognized for quality and value. Our knives are sold throughout the world, and have received many accolades from international knife expositions and magazines. The downside of this success is that our products, like those of Rolex® and Microsoft®, are now being counterfeited by unknown and unauthorized companies which we believe to be in China. Many of these knives are sold on web sites at ridiculously low prices, although we have also found blatant knockoffs being retailed in Iraq and other countries. The counterfeiting is taking two forms. Cheap copies of actual CRKT® designs. Some rip-off artists are making cheap copies of popular CRKT® designs. These copies look similar to our products, but are usually shoddily made using inferior steels, coatings and handle materials. They illegally feature the CRKT® logo and markings. When viewed on a low-resolution web site image, these knives can’t be distinguished from the real thing. However, when handled and compared to a real CRKT® knife, their lack of quality, poor assembly, and inferior folding and locking action is obvious. The buyer will also notice lesser edge-holding ability after a little use. Unrelated designs with the CRKT® logo. A visit to the Chinese eBay web site will reveal an array of strange and inferior knife designs which have never been produced by CRKT®, but which display the CRKT® logo prominently. Again, this is a violation of international trademark law. Similar rip-offs are originating in South Africa. Worse from our point of view, is the suggestion that we would design and manufacture such junk products. We have taken pride that CRKT® products are designed by some of the world’s leading custom knifemakers and industrial designers. So these knockoffs are doubly insulting to our brand name: both poor in quality and poor in design. The knife/package he forwarded was illegal and deceptive in almost every measurable way, including. A poorly reproduced “CRKT” clampack package with name, trademark, artwork copyright and country of origin violations, complete with a duplicated UPC code. 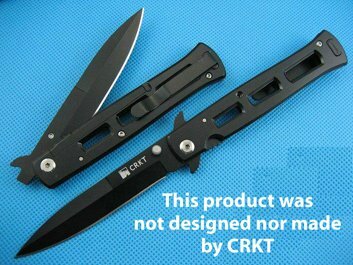 Plastic and printing quality was far lower than a genuine CRKT® clampack. The knife itself is deficient in almost every visible and measurable way. Poor lockup. The counterfeit locking liner allows vertical play. It closes with a “clunk” instead of the crisp “snap” of the genuine product. Different pivot screw. It is flat, not checkered like the original. Shoddy substitute thumb studs. The knockoff thumb studs are misaligned and loose. They are not checkered for grip. Crude rip-off of patented Locking Liner Safety mechanism. The counterfeit uses an illegal copy of the Locking Liner Safety mechanism which is covered by U.S. patent 5,596,808. The sample’s actuating lever is badly bent. In contrast, genuine CRKT® M16-14SF models come with our patented Automated Liner Safety which is marked with a red dot and automatically converts the folder into a strong, rigid knife when opened and locked. Under weight and dimensions. The counterfeit knife is slightly shorter, has thinner aluminum scales and weighs only 5.2 ounces. There is considerable compression flex in the frame with hand pressure. The genuine M16-14SF weighs 5.4 ounces, and its heavier 6061 T6 aluminum scales yield virtually no flex from hand pressure. Visibly crude blade grind. The counterfeit blade grind is noticeably different from the genuine M16-14SF designed by Kit Carson. The counterfeit blade also shows pitting and grind marks. We could go on about inferior materials, construction, coatings and finishes on this knockoff, but that is not our point. The counterfeit sample is a demonstrably inferior product, cunningly designed to deceive the consumer. Buy from a reputable dealer. If you buy a CRKT® product from a reputable retailer, whether cutlery, sporting goods, hardware or department store, or a known internet retailer, you can be sure that you are receiving a genuine product and that the retailer and CRKT® will stand behind the product. Your purchase of the new CRKT® products will be covered by our appropriate warranties, including our excellent Limited Lifetime Warranty on new knives. Consider the price. If a price for a new “CRKT® product” seems to be too good to be true, it probably is. Unlike some manufacturers, we set our Manufacturer’s Suggested Retail Price (MSRP) recommendations at very competitive levels. So we don’t anticipate that a quality CRKT® product will require a much lower “street price” to be a great value. If you see a new “CRKT® product” on the web reduced from $79.99 to $19.99, an alarm should go off. 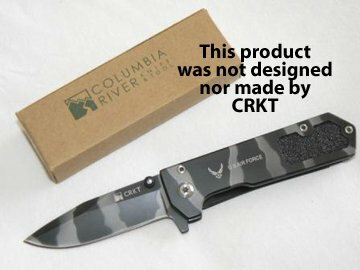 This is very likely a knockoff, and not a genuine CRKT® product. We know you will find some occasional used knife bargains on sites such as eBay and Craigslist, but there really is no way to know how much use or abuse these knives have received. So again, it is a matter of buyer beware. If you pay through an escrow service, you may be able to return an unsatisfactory knife, but the CRKT® Limited Lifetime Warranty is valid only to the original owner. Who is damaged by knife piracy? No one wins when a hidden factory overseas decides to counterfeit a shoddy knife or tool product. The manufacturer and the designer have their reputations and their brand name damaged. The legitimate dealer loses sales to these much-lower-priced products. But the consumer takes the most risk for several reasons. First, the consumer takes the risk of serious product defects, and the possibility of product failure and/or injury. The knockoff pirate company is not to be found to make good on the failure, or even to be pursued for damage claims. Second, the inferior quality of knockoffs usually results in poor performance, reduced edge-holding ability and short product life. These are not the real CRKT® knives and tools that users tell us they cherish for years and years. If it seems too good to be true, it probably is. As much as we all love a bargain, we recommend that the consumer should shop carefully. At conventional retailers, examine and compare the products you want to buy. This gives you the ability to see finish colors and textures which vary somewhat, especially in natural and swirled CPL materials. It gives the consumer a chance to check the action of folding knives, the carry capabilities of sheaths, and the working ability of tools. When buying via mail order or etailers, select those that have satisfaction-guaranteed return policies. Then you can always return a knockoff product that doesn’t measure up to genuine CRKT® quality standards. In both of the above cases, CRKT® stands behinds the quality products we make. We, in concert with other concerned manufacturers, are taking all possible legal measures to put the knife and tool counterfeiters out of business, but this is an international problem that is not going to be quickly resolved.